Described as a fantasy drama film, Beasts of the Southern Wild tells the story of a father and daughter fighting for survival in a Southern Louisiana bayou called the “Bathtub”. 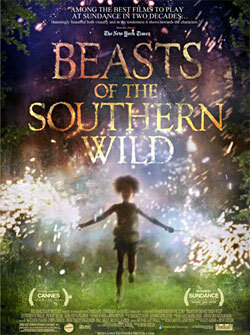 The protagonist is six year old Hushpuppy, a wide-eyed girl abandoned by her mother who is raised by her short-tempered father nicknamed Whip, who struggles with a life-threatening illness. Before a storm arrives and destroys the Bathtub, Hushpuppy learns of the Aurochs, ancient mythical creatures trapped inside melting ice caps. As the film progresses, the “beasts” are freed from the ice which has encapsulated them. This film is carried by its two leads: daughter Hushpuppy and father Whip, both of whom deliver incredible performances in this low-budget epic. Their relationship is tenuous at best but the 9-year old protagonist brilliantly communicates the complex character, and at the same time became the youngest ever Academy Award nominee for Best Actress. Watching this film I felt it was truly art, unlike so many formulaic movies that follow in the well-traveled footsteps of others. It packs a strong emotional punch, and the fantasy element of the Aurochs lends this movie an imaginative flair which reminded me of Where the Wild Things Are. Abstract and beautiful like a Björk music video in feature film format.